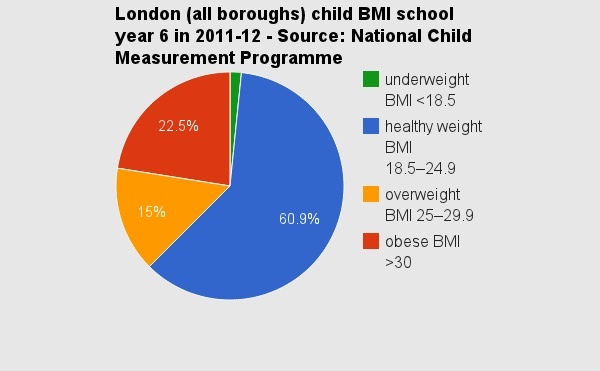 Child obesity in London has been on the rise since 2006 despite attempts to reduce figures and there is a large gap between boroughs, with Islington not far from the capital’s highest, new figures from the National Child Measurement Programme (NCMP) show. 22.1 per cent of Islington children in year six were classed as obese last year – leaving only a small gap to Southwark, which has the worst obesity rates at 28 per cent. The capital has seen various programmes over the years to fight obesity. The NCMP, a government initiative, is one of them but it has delivered few results so far. If anything, obesity in primary schools is rising: nearly a quarter – 22.5 per cent – of year six school children in 2011-12 were classed as obese, a jump from 20.8 per cent in 2006-07.